More: Check our guide to the best PC games. This isn’t an exhaustive list, but it is an exhausting list of reasons why I’ll never touch Windows 8 again. I’m not alone:gamedevelopersworldwidehave declared Windows 8 a catastrophe. Windows 8 brings a new kind of computing design to the desktop. Once called Metro (until Microsoft realised that Metro is also the name of a German supermarket), it’s a design motif that’s meant to be appropriate across tablets, mobile phones, the desktop, and eventually, televisions. To be fair to Microsoft, Metro is a decent way of poking at your computer with a finger. But when you have the flexibility and precision of a mouse, it makes no sense. In Metro Most of your screen is taken up with white space. Text is bigger, the buttons are bigger, the borders are bigger. There’s less information, more wastage. It’s a complete mess. 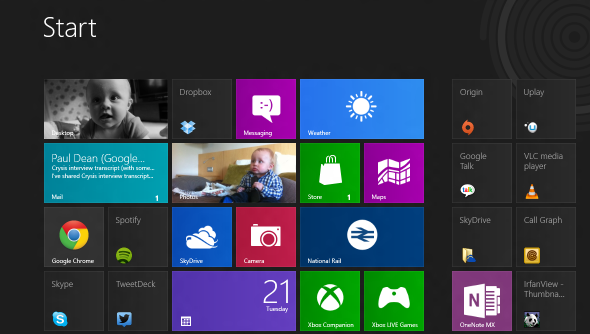 The Metro interface is Windows 8. The desktop that you’re used to is also there, but it’s built as a separate app. Think of it this way: Metro is the shell. The desktop is an app within that shell. If you want to start Steam, you’ll want to launch the Desktop app, and then launch Steam. This is insanity. This is Windows 8. Metro apps don’t have any window controls. If you want to swap between apps, you have to make a convoluted mouse gesture – move the mouse to the top left of the screen, and then down to select the window. You can’t minimise the app, and there’s no on-screen preview of what’s running to help you quickly switch between programs. You can pick up windows and shunt them, say, to a second screen, which initially feels relatively useful. But I’ve discovered more than anything that you spend more time fiddling with their arrangement than actually doing anything useful with them. I can’t get over how Microsoft have managed to break one of the basic functions of a GUI – swapping between running programs. Metro programs have no window controls and take up the entire screen. Therefore, there’s no easy way to switch between them using on-screen controls. You have to engage in unfamiliar mouse movements to swap between them. There are certain things that you do with your PC every day that should form the basis of the operating system. Email. Instant Message. Calendars. Media Playing. 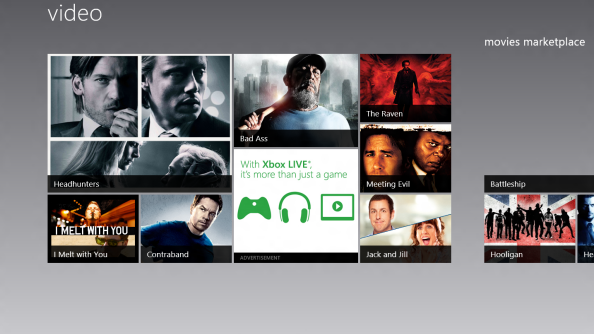 All of these functions in Windows 8 are carried out through Metro apps, and they are universally awful. There are no desktop apps included that do a similar job. The email app is horrendous. 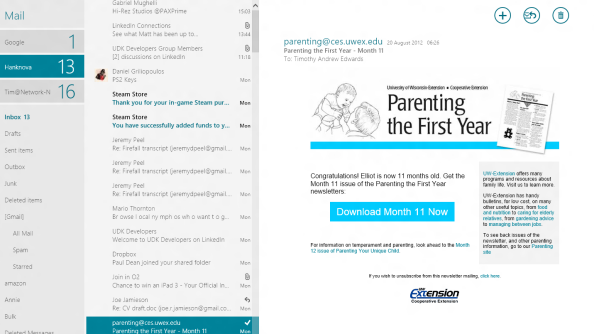 It is the worst email client I have ever used. It’s a full-screen Metro abomination that hides or is missing basic and vital functionality (search, column sorting, filtering). It’s full-screen, but only shows a small sample of your messages – so the screen real-estate is massively wasted. If you have multiple email accounts, there’s no combined inbox view. It’s slow to check and sync your email – unless you force a manual refresh. And the first time you use it, you will struggle to find the ‘send email’ button. Pro-tip – it’s the (+) in the top right. The instant message app is near unusable for day-to-day work or play. It’s a full-screen Metro app, so it takes up all your screen when all it needs to do is appear in a small box. There’s no combined contact view – if you want to start messaging people, have to enter a separate app (the people app), and select message from within that. It currently only supports MSN and Facebook messages – so you’ll still have to run a Google Chat or IRC client separately. But because it tries to combine message accounts, you’ll often discover that friends will receive messages over different accounts, at the same time. I’ve had situations where my friend is receiving the same message on Facebook and MSN at the very same time. Other times, the app has refused to let me even enter a message into the box. It’s so utterly and intensely ludicrous I hate it’s very guts. I’ve given up entirely on the calendar, because it’s terrible. Changing to a week or day view requires a right click to make the control interface appear. I can’t work out how to edit an appointment, nor can I work out how to delete an appointment. There’s no way to show events from just one calendar. I think it may well be easier to alter my own birthday than to edit when it’s currently set for in the Windows 8 calendar. I really want to be making this up. The default Windows media player is a full-screen Metro abomination. It’s slow, and the interface is clunky, and you’ll struggle to find and play the files you want. Worse, though, is that it struggles with complicated storage options. All of my music and video is stored on a Network Attached Storage device – but the Windows Video and Music players can’t seem to index those files. If I want to play something, you have to work through the folder structure using Metro’s awful internal file browser. There are two versions of Internet Explorer, both bad. The first is the Metro browser, and it’s essentially unusable on a desktop which hides basic controls light refresh, the browser bar, the back button and everything else you use on a day-to-day basis behind a right click. The Metro browser is the default – so any Twitter links you click until you can turn it off, will be opened in the Metro browser. The Desktop app version of IE isn’t necessarily terrible – it just occasionally takes over your default browser when you’re not looking. Despite me regularly returning the default browser to Chrome, IE still decides it wants to be the default option for opening links sent by IM, and the option to change it is greyed out. Google Chrome has now silently updated to integrate better with Windows 8. Now, when it’s started from the Start Menu, it opens up an entire full-screen window, and it can only be displayed in that full-screen window. The only route to prevent that happening is to install a shortcut to the app on your taskbar. When it’s started from the taskbar, it behaves as you’d expect. The ribbon from Microsoft’s office products is now integrated into the Windows interface. For instance, in the file manager, rather than the ‘view’ menu being neatly arranged into vertical options, if you click view on a window it displays a ribbon of all the options in the view menu with randomly placed icons next to each-other. The charms barappears when you hover your mouse in the top right or bottom right corner of your screen. It’s meant to help you with basic but universal tasks. Like search, or sharing. Butthe search function rarely finds what you want – it will only search within Metro apps, and you have to specify the app you want to search in separately. 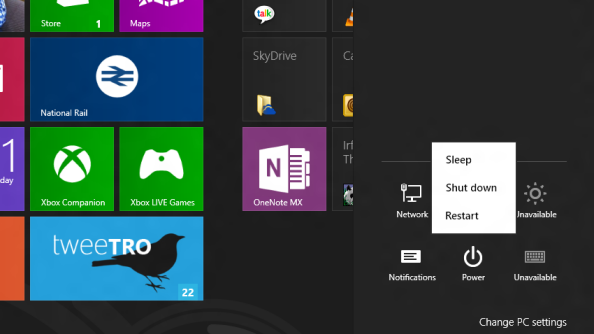 The share button only works in Metro apps, as well – you can’t share from within any desktop apps. So it’s entirely pointless. Yes, there are bugs in Windows 8. And yes, they’ll probably be ironed out as development continues. But some of the bugs I’ve encountered as so weird as to suggest my entire PC has been traumatised. In order: Star Wars: The Old Republic now simply refuses to update. I can’t play full-screen video on a second monitor in Chrome. There are no drivers available for the bluetooth chipset on my motherboard. Unity games, like the brilliant Brickforce, don’t work. It goes on, and on, and on. It took me nearly half an hour to work out how to turn off my PC. So: here’s exactly how you do it: You move your mouse to the bottom right or top right of your screen. You then click on options. You then click on power, and then finally, you click on the Shutdown option. Windows 8 comes out in just under two months – it’ll be available from October 16th. You should not buy it.